Quality TENS Unit Electrodes means less replacement costs down the line. OTCWholesale carries some of the very best TENS Unit Carbon Electrodes on the market. 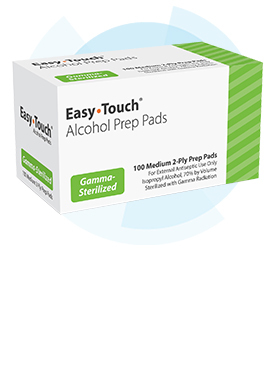 High Quality Electrode Pads will save you money in the long run by providing you with multiple use - up to 15 treatments - before replacing. They can be used as TENS unit Electrodes or Muscle Stimulator Electrodes. 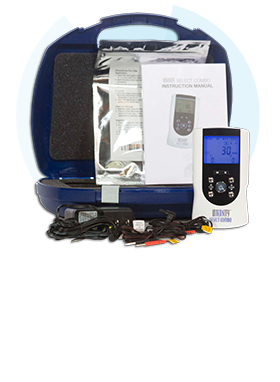 Prolong the life of your TENS Unit Electrodes by purchasing our Electrode Care Kit! Why use Silver Electrodes instead of Carbon Electrodes? What is the advantage of foam backed electrodes? What type of electrode gel do you recommend? How do I properly care for my electrodes for maximum use? How does a TENS Unit help pain? What is the difference between TENS and Muscle Stimulation? We offer a broad selection of Electrotherapy products such as Digital TENS Units, Muscle Stimulators, TENS Electrodes, Portable Ultrasound Units, and other TENS Unit Accessories at great prices. If you are a retailer or are interested in a quote for larger quantities of any electrotherapy products, please call or email us by clicking here. Silver Electrodes refer to carbon electrodes that include a thin layer of silver between the pad and the backing where the actual wire connection is made. This silver forms a better connection between the wire lead and the electrode, and distributes the electricity more uniformly across the pad. Silver Electrodes are slightly more expensive to produce, but they are substantially more effective at delivering the electrode stimulation treatment to the effected site. 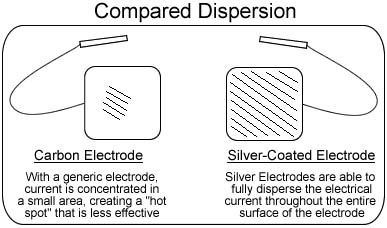 Results of a dispersion test on Silver Eleoctrodes vs. Carbon Electrodes will show a much greater dispersion area with more intensity on the silver coated electrode. Our silver electrodes also use copper lead wires with special heads that help promote greater dispersion and prevent wire pull out. You simply cannot buy a better TENS Unit Electrode! Whether you are using a TENS unit, Muscle Stimulator, Interferential unit or a Galvanic unit, you will get a lot more out of it using a silver coated electrode. Many clinical therapists recommend foam backed electrodes when the treatment is combining hot and cold therapies with electrode stimulation. The foam backing repells mosture created by the treatment and ads insulation between the external therapy and the electrode pad. Many of our customer prefer the foam backed electrodes for their smooth touch and flexibility, though they are somewhat more high profile than the mesh backing. Mesh or cloth backing is lower profile and generally slightly more flexible than thier foam backed counterparts. What type of gel do you recommend? We select all of our electrodes from reputable suppliers and most of our electrodes feature a brand name or an American made gel for maximum reusability. This adds a slightly higher cost to the manufacturing process and to the price of the electrodes. There are less expensive electrodes available using a foreign made adhesive and we are currently testing thier reusability to make sure that usage is up to our standards. Some of our economy electrodes currently using a foreign made gel and feedback has be very good. Transcutaneous Electrical Nerve Stimulation (TENS) is a non-invasive, drugfree method of controlling pain. TENS Units use tiny electrical impulses sent through the skin to nerves to modify your pain perception. The main use of a TENS machine is for pain relief, particularly in the case of chronic pain. It is most often used for joint or muscle pain that won't go away, but can also be used to help treat nerve problems without resorting to drugs. It isn't uniformly effective, that is, different people will have different results. For some, TENS electrical pulses interrupt the pain signals so effectively that they are literally without pain. For others, the relief is nearly non-existent, but most commonly, this treatment provides considerable relief from the chronic pain that haunts the user.When the TENS Unit overrides the pain signal, it "tricks" the brain into thinking their is NO PAIN. TENS Units provide relief with nerve stimulation for back pain, foot pain, shoulder pain, neck pain, and virtually any other acute or chronic pain. Two small electrodes that are placed on either side of the area where the pain originates. The higher frequencies tend to block the pain signals, while much lower frequencies will stimulate the body to produce endorphins which naturally reduce pain. When the TENS Unit overrides the pain signal, it "tricks" the brain into thinking their is NO PAIN. TENS Units provide relief with nerve stimulation for back pain, foot pain, shoulder pain, neck pain, and virtually any other acute or chronic pain. The main difference between the two is that a muscle stimulator is used to cause muscle contraction, while TENS focuses on nerve stimulation and tries to avoid contracting the muscles. Both use electrical pulses to do their job, but have different purposes. Muscle Stimulation is a very similar machine to the TENS, also using two electrodes to send electrical pulses through the body. However, the purpose is quite different. Here, the purpose is to cause the muscles to contract and the reasons have nothing to do with pain relief. Both TENS machines and muscle stimulators have their uses, but they are very different in their reasons for being used. If you are looking for an alternative to standard pain relief, then the TENS machine is what you should be looking at. However, for the prevention of atrophied muscles and to define specific muscle groups, the muscle stimulator is the way to go. What is does Single, Dual or Quad Channel mean? Generally, the TENS or muscle stimulator signal is between two electrodes or on a single channel. Therefore, the user can apply electrode stimulation to one site per channel. A dual channel device allows for stimulation in two locations using 4 electrodes and a quad channel device can use up to 8 electrodes. It is not necessary to use all of the channels available on a device, but each channel requires a pair of electrodes. The modes of the device refer to preset stimulation effects with changes to pulse rate, pulse width, modulation, frequency and sometimes amplitude. These modes are sometimes programs that start off at a certain rate and then proceed to other modes of stimulation. The purpose of these modes are to help the user quickly and effectively apply a therapy that is suitable for an individual complaint. Stimulation can be very specific to an area of the body and the cause of the pain. For instance, the Ultima 20 mode device has specific mode setting for Neck, Torticollis, Low Back, Sciatica, Epicondylitis, Wrist Pain, Post-Surgery knee pain, Ankle sprain, Knee pain, Hip pain, Menstrual pain, and Neuralgia, as well as, 8 additional preset modes. How are IF Units and Galvanic Units different from TENS Units? Interferential Stimulation differs from TENS because it allows a deeper penetration of the tissue with more circulation and comfort. Interferential Stimulator (I.F. 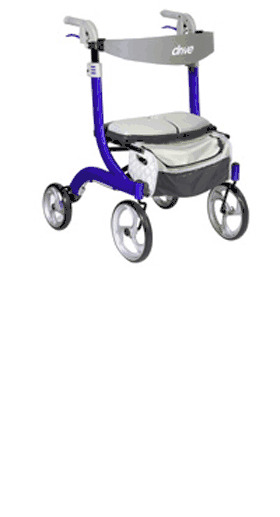 Unit) is used to treat, relieve and manage chronic pain. It can also be used as adjunctive treatment in the management of post surgical and post traumatic acute pain. Interferential Units provide deeper stimulation that traditional TENS Units. Interferential Stimulators are a low frequency treatments with the transmission of pain messages at the spinal cord level. It stimulates underlying nerves producing a mild, tingling sensation to provide relief from chronic and acute pain. 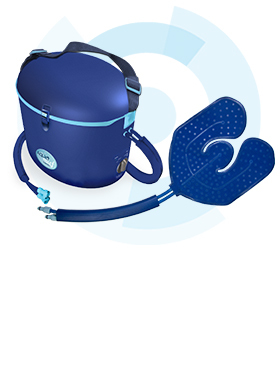 Interferential is used for very localized areas where deep current for pain control or increased circulation is needed. Galvanic stimulation is most useful in acute injuries associated with major tissue trauma with bleeding or swelling. In contrast to TENS and IF units, which apply alternating current, galvanic stimulators apply direct current. High-voltage Pulsed Galvanic Stimulation (HVPGS) is being used for wound healing, edema reduction and pain relief carpal tunnel syndrome and diabetic neuropathy are examples of where galvanic stimualation is used. Direct current creates an electrical field over the treated area that, theoretically, changes blood flow. The positive pad behaves like ice, causing reduced circulation to the area under the pad and reduction in swelling. The negative pad behaves like heat, causing increased circulation, reportedly speeding healing.